Calculate projection distance and screen size using the on-screen icons or entering numerical values. Speed. Quality. Excellence. Learn about our award-winning Service & Support. See the contact information for the Canon Projector Account Manager that covers your state. Dependable and durable, the laser light source offers a long projection life of up to 20,000 hours*1. Because there are no lamps or filters to replace, you can expect the LX-MU500Z to run continuously and virtually maintenance-free. To put that in perspective, if the projector ran for 8 hours every day it would keep going for 2500 days, or 7 years, representing a much lower total cost of ownership than conventional lamp projectors. The LX-MU500Z delivers native 1920 x 1200 WUXGA resolution for a high-definition widescreen picture, while 5000 lumens and a 50,000:1*2 contrast ratio ensure a clear, bright image - even in challenging environments. A range of Preset Image Modes including Standard, Presentation, sRGB, Movie, DICOM Simulation*3 and two customizable user modes make it easy to maximize the quality of the image for the material you are projecting. Installation is convenient thanks to the LX-MU500Z's generous lens shift (±50% vertical, ±23% horizontal), plus a wide throw ratio of 1.36 - 2.18:1. Whether using the projector in classrooms or conference halls, it's easy to achieve the image you want. 360° positioning also allows both landscape or portrait orientation, making the projector flexible for digital signage in retail and museum settings. Connectivity is also versatile with dual HDMI ports as well as HDBaseT™ to simplify your connections with non-compressed HD video, audio and control signals that can be transmitted utilizing a single Ethernet cable over long distances of up to 328 feet. 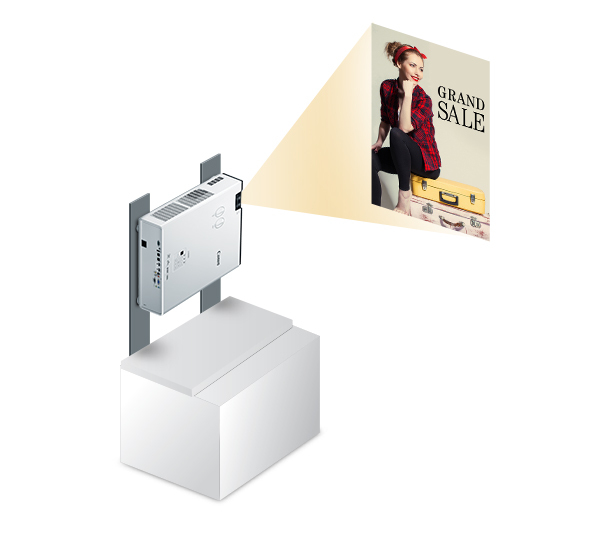 The LX-MU500Z also features an MHL interface (Mobile High Definition Link), so mobile content from a tablet or smartphone can be viewed directly onto the projected screen when connected via HDMI. 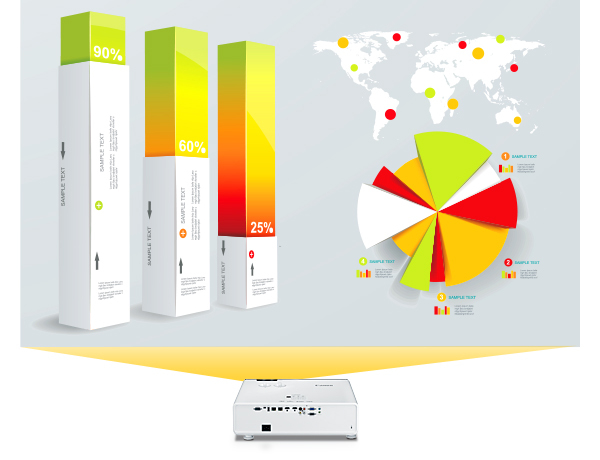 AV network management systems are also supported; the projector is compatible with Crestron RoomView and AMX Device Discovery to help users minimize downtime and maximize productivity. Backed by Canon's award-winning Professional Service & Support, the LX-MU500Z includes the Canon 5-Year Laser Projector Limited Warranty, as well as a 3-Year Advanced Warranty Exchange Service Program and a 3-Year Service Loaner Program for further peace of mind. This projector projects bright 5000 lumen images with a 50,000:1*2 contrast ratio that helps ensure deep blacks, bright whites and excellent color. They feature clear depth and dimension, and great color accuracy, which is critical to those with discerning needs. *2 Full white, full black, Image mode set to presentation. Light source turns off when full black is projected. Dynamic contrast ratio. The projector's laser light source provides up to 20,000*1 hours in standard use of continuous, reliable, high-quality projection. Operation is virtually maintenance-free with minimal downtime, as the light source doesn't require routine replacement. This keeps running costs relatively low when looking at the total life of the product  a key consideration for challenging and hard-to-reach installations. Other advantages of the laser light source include installation flexibility and more. Because this projector uses a laser light source instead of a conventional lamp it can be installed at any angle on a 360° axis facing in any direction. *1 This is an estimated value, actual hours may vary depending on usage and environment. This is not a guarantee of the life span of individual laser diodes. *5 Air vents should not be blocked. See User Manual for recommended installation. This projector utilizes Single-chip Digital Light Processing (DLP®) technology which is a widely utilized projection technology that creates natural and lifelike images. The DLP® technology utilizes a color wheel along with a reflective Digital Micromirror Device (DMD) to produce video and images with high brightness. The resulting high-resolution video and images maintain the details inherent in what you are showing. sRGB: Ideal for projecting images from sRGB-supported digital cameras. 2 Customizable Modes: Ideal for custom set-ups. Provides up to 2 user-selected combinations of image quality settings that can be stored in the memory and selected as an image mode. DICOM Simulation Mode*3: Ideal for displaying medical images in non-diagnostic settings. Both Blue Base and Clear Base settings are supported. *3 This projector includes a DICOM Simulation Mode. It has not been cleared or approved for medical diagnosis and should not be used for these purposes. 6-Axis Color Adjust: This technology lets users fine-tune the hue and saturation of each of the primary and secondary colors, providing a high degree of control that can make each projected image a "masterpiece." 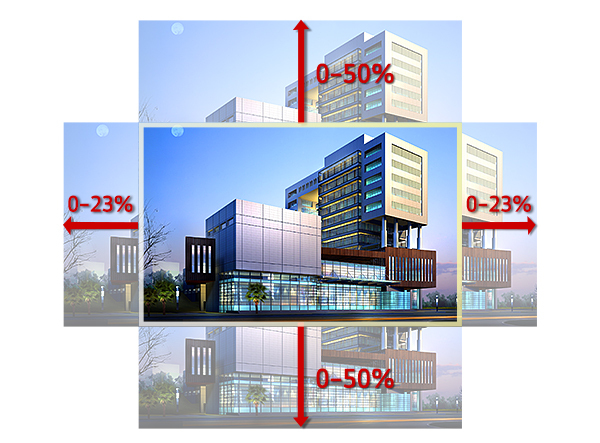 Manual vertical (±50%) and horizontal (±23%) lens shift allows for adjustment of the image with virtually no distortion. 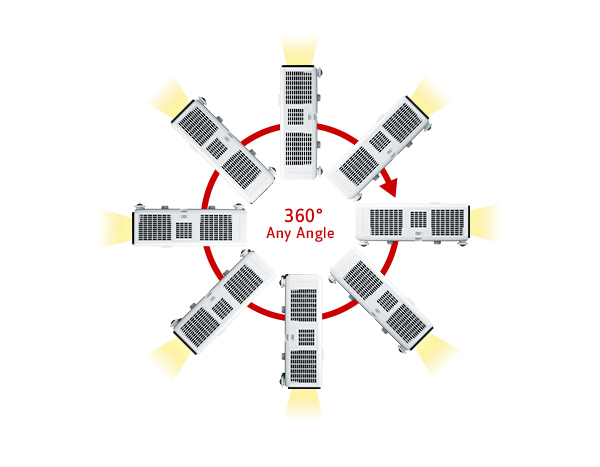 360-degree projection*5 allows the projector to be positioned anywhere on the vertical axis. Fan speed can also be adjusted to help optimize results (depending on projector positioning). 1. A third-party stand must be used for portrait orientation. Do not place the projector directly on the floor. When the lens is pointing a downward direction. When the air-intake vent is pointing a downward direction in portrait orientation. Allows the corners of the image to be independently adjusted to help ensure optimal image reproduction. 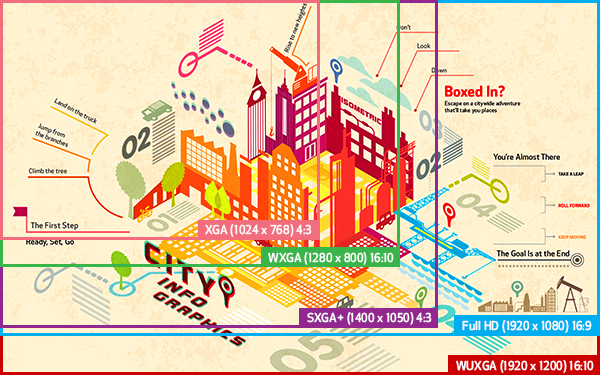 Enables users to fine-tune the colors of images based on the color of the projection surface. Adjustments can be made from Normal and Greenboard, as well as additional tuning for projecting onto virtually any other colored surface. Connections include: HDMI, HDMI/MHL and analog RGB computer connectors; S-Video input; RCA inputs; and a LAN connection terminal which relays data to a built-in HDBaseT™ receiver for transmission of video and audio signals from a source device. Industry-standard control and networking inputs include a network-ready RJ-45 port enabling authorized users to manage and control multiple projectors from any PC on a network, an RS-232 serial connection for monitoring the projector locally through a third-party control system, a USB Type A port for power output and a USB mini B port for easy installation of firmware upgrades. Compatibility with Crestron RoomView and AMX Device Discovery helps ensure seamless integration into many systems or infrastructures and smooth network management. All Canon Laser Projectors offer peace of mind as they are backed by Canon USA's Laser Projector Limited Warranty, which guarantees that the projector will be free from defects in workmanship and materials for 5 years from the date of original purchase or 12,000 hours of use (whichever occurs first). For complete terms and conditions click here. The Canon Advanced Warranty Exchange Service Program*4 provides you with enhanced warranty service in addition to traditional “mail-in” repair service. The exchange program provides a replacement unit in exchange for your eligible inoperative Canon Projector if repair service is required during the product's limited warranty period. The Canon Service Loaner Program*4 provides a loaner product in the event that your eligible Canon Projector is in need of repair during the limited warranty period. The loaner projector may be used while your inoperative unit is being serviced via Canon's “mail-in” repair service. The Canon CarePAK PRO AV Extended Service Plan*4 offers options for one year or two years additional coverage for up to five full years of service and support from the date the Projector is purchased (only available on select models). *4 Programs and service offerings subject to change without notice. For complete details, including terms and conditions for each program, or to learn more about Service and Support offerings for Canon professional projectors, please contact a Canon sales rep or call 1-800-OK-CANON. Wide: 60" - 300", Tele: 60" - 200"
17.7" x 6" x 14.9"
*3: Full white, full black, Image mode set to presentation. Light source turns off when full black is projected. Dynamic contrast ratio.